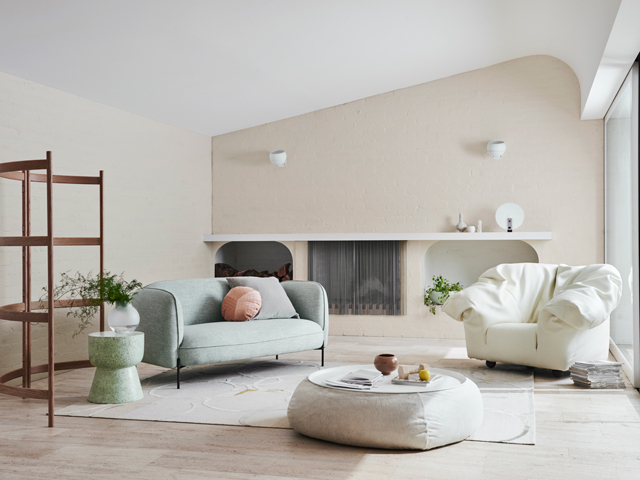 Wholeself is one of the four palettes identified in the 2019 Dulux Colour Forecast 'Filter'. This soothing collection comprises muted shades of powdery pinks and warm neutrals, enlivened by accents of muted citrus and a minty blue-green. It speaks of simplicity and understated luxury and pairs beautifully with this season's mid-tone timbers, soft undulating lines and relaxed design detailing. "The Wholeself palette is all about slowing down and tuning into the things that really matter," says Dulux Colour and Communications Manager, Andrea Lucena-Orr. "Wellness has emerged as a major theme in the design world for 2019, with many of us looking to switch off our digital devices and focus on nurturing our tired bodies and spirit. The Wholeself palette brings this theme to life." "It has a serene yet cocooning feel, with gentle colours and subtle textural layerings, that hint at creative exploration and new beginnings. Powdery peach/pink has emerged as a key base colour, with accents of clay, gold and blue-green adding a fresh, modern spin. "This palette is a significant shift from the playful brights and rich, luxe tones of last year. Rather than looking outward for inspiration, this season's understated colours and intriguing textures draw you inwards and encourage moments of stillness and mindfulness. "Expect to see a paring back of the overdone or unnecessary; the idea is to surround yourself with furniture and accessories that serve a purpose and bring you happiness. Environmental awareness will be an important thread running through design in 2019; rather than discarding those pieces we no longer have a use for, we'll be encouraged to repurpose or reimagine them in a new way," she says. "This season's gentle, reflective colours are easy to live with and work beautifully with Dulux Most Loved Whites," says Lucena-Orr. "Or, pair them with the neutral greys and greiges that are so popular right now." "When choosing colours from this trend palette, think about how they'll work with your existing furniture, flooring and soft furnishings. You should also factor in the room type and any colours in adjoining spaces. One area this palette works particularly well is the bedroom. In this space it can create a calm and restful feel. "If you want to include a smaller volume of these new colours in other rooms, you could use them on a single wall, a feature nook, a piece of furniture or a door. "The great thing about colour is how quickly and easily it can transform a space. Whether you choose to paint an entire room in this season's hues or add smaller accents, pull out your paintbrush and watch the space come to life. And if you tire of the look some time down the track, you can simply paint over it." • Curves are key; choose furniture with rounded edges and soft, sumptuous cushioning. • Balance out soft pastels with warm, mid-tone timbers. • Add in contrasting natural materials, such as a stone, wool and linen in the form of side tables, accessories and cushions. • Inject small doses of unexpected brights, such as citrus, mint and gold, through decorative accessories such as vases and tableware. • Give new life to an old piece of furniture, by painting it in a complimentary tone, or a contrasting accent colour. 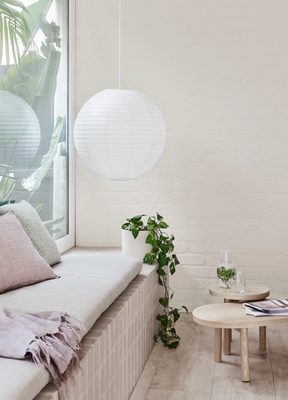 Photo credit: Dulux Australia - Summer Trends 2019.